We all know that, for most of us, interviews are not much fun. For some of us, they can feel more like torture. Nerves, stress, pressure – all can go into overdrive when we work ourselves up over an important upcoming interview. As if this isn’t already bad enough, many interviewers deliberately make things tough for us by asking nasty questions, throwing curveballs, sitting there poker faced. One experienced interviewer, a Managing Director at a global investment bank, once told me that his primary aim in an interview is to “drag the candidate out of their comfort zone, just to see how they react”. In other words, put the candidate under pressure and assess how they behave in a tough situation. Do they remain calm and clear-headed, or do they go into meltdown? Depending on which way the candidate goes, the interview is either back on track, or it’s game over. 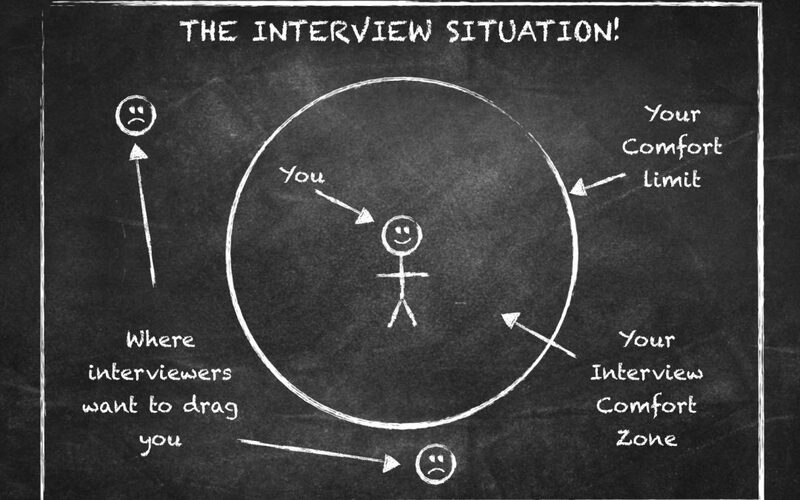 So when you are next in the hot seat, what can you do to stay in your Interview Comfort Zone? Before I give you the answer, it’s worth taking a moment to understand why an interviewer would want to take you out of your comfort zone. Business is all about handling challenges, reacting to unexpected issues and solving problems. “How do we improve staff motivation?”. Handle problems well and businesses move forward. Handle problems badly, and businesses lose clients, reputation, money. Since handling and solving problems and challenges is a core part of business life, it makes sense to test your capacity to handle problems and challenges in an interview. So taking you out of your comfort zone is essentially an attempt to simulate the daily real-world environment. Handle it badly in an interview and the interviewer will assume you will handle it badly in the business. So, now that we understand why an interviewer would do this to you, what’s the best way to handle yourself in such a situation? This means that you should go into the interview expecting to be thrown that curveball question, have your limits tested, and be dragged out of your comfort zone. That way, when it happens, you’ll already be in a mindset to handle yourself well. It’s a bit like watching a horror movie and expecting the monster to jump out – if you expect it, it’s less frightening. You are less likely to panic or freeze. If you aren’t panicking, you are more likely to be resourceful and think through the situation with a clear head. There’s science at work here too. When you feel stressed and under pressure, the hormone cortisol is released into your brain. This is the ‘fight or flight’ response kicking in, pumping up your heart rate and sending blood to your muscles as your brain thinks you need to be ready for combat. At the same time, your ‘conscious mind’ – that part of your brain which is need to think clearly and solve problems – becomes less active and available for clear thought. Just when you need it most, it turns itself off. Imagine running away from a charging lion and trying to think through a complex problem at the same time – it’s just not possible! By refusing to panic you keep your brain in the best possible shape to help you swim back into your comfort zone. Reflect on what makes you uncomfortable in an interview. It might be having your technical skills challenged (I would always challenge a candidate whose technical skills looked suspiciously good on their CV). It might be having to articulate a story that highlights your behavioural competencies. You might even be uncomfortable with making good eye contact, or talking about yourself in a positive way (most of us under-rate our own abilities). Becoming more aware of these blind spots leads naturally to taking action to fix them. This is all part of effective preparation (you do prepare thoroughly, right?). And as you fix your blind spots, your comfort zone naturally expands outwards. You are more capable of answering tricky questions, and more confident that you can handle what is thrown at you – a real double whammy. Think of it as a game with your interviewer. They set off in search of the edge of your comfort zone, only they can’t find it. All they find is you being comfortable, capable and competent. 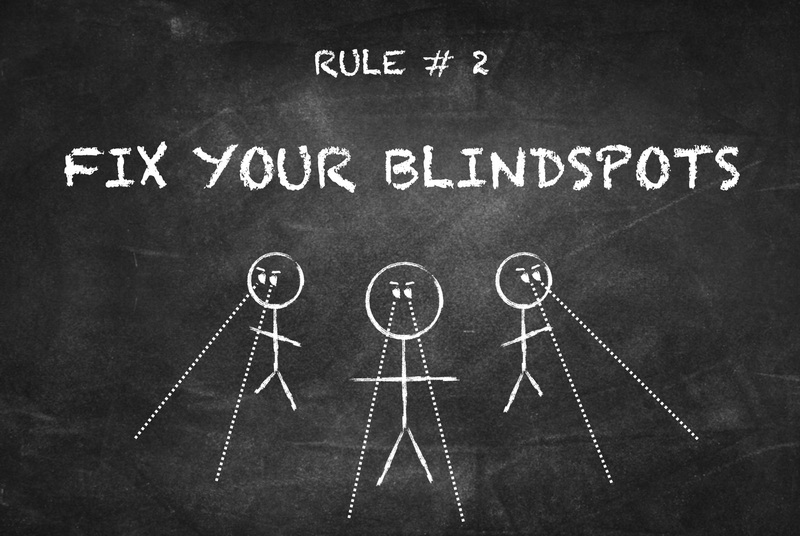 Frustrate their search for your blindspots! RULE #3 – THROW A COUNTERPUNCH! One of my favourite analogies for an interview is a boxing match. Two people, locked in combat in a tight space over a short period of time. One (the interviewer) looking to land a knockout blow, the other (the interviewee) trying to dodge and weave and secure a points victory in a close-fought contest. Getting dragged out of your comfort zone is like being pushed onto the ropes. Even the best boxers can be pushed onto the ropes if they get caught off guard. But the best boxers don’t panic. They keep their gloves up and look for a chance to get off the ropes. To land a counterpunch, push the opponent backwards and get back into the middle of the ring/comfort zone. So if your interviewer pushes you onto the ropes, while you are keeping a clear head and refusing to panic, plan a counterpunch. 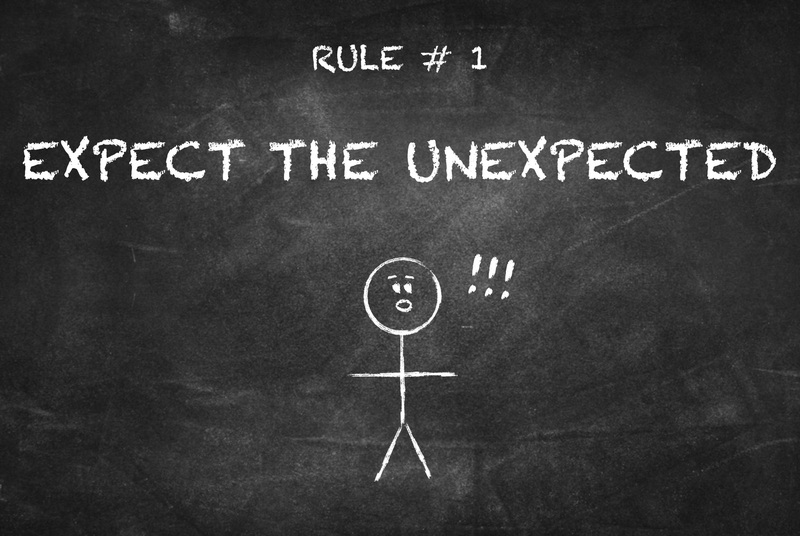 What can you come back with that will surprise and impress your interviewer, maybe catch him/her off guard? Just keeping your wits about you and frustrating the interviewer’s attempts to land a knockout blow will buy you time. Think through the problem/challenge and break it down into parts. Discuss your thought process with the interviewer, offer up partial solutions to see if you are on the right track. Perhaps it’s time to deploy that powerful, incisive question that you’ve been keeping in reserve (find out more about asking great questions in this article). Or reveal some in depth knowledge about the company or opportunity that shows you have really done your homework. Ultimately, not everyone has all the answers anyway. If you are genuinely stuck for a good answer, say that in a work situation you would normally ask colleagues for help if you are unable to solve something on your own. That’s a much better outcome than simply thrashing about helplessly – something that in business usually compounds problems and brings financial implications. Whatever route you choose, get off the ropes and back into the middle of the ring. You’ve dodged a knockout blow and can refocus on going the distance and scoring a points victory. 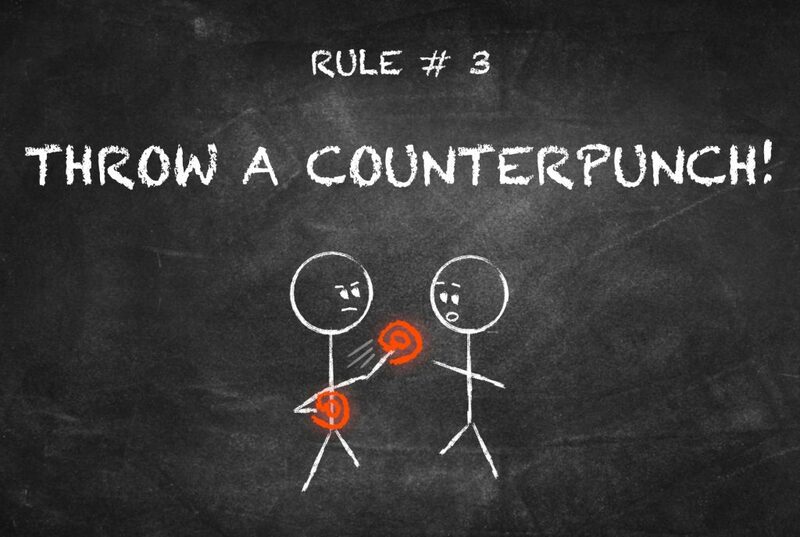 Rule # 3 – Throw a counterpunch! By learning them and putting them into practice, you will enter interviews with more confidence, be prepared for a rough ride, and have a few tricks up your sleeve to come out on top.